Herein lies the mystery. Were the Sinclairs of Argyllshire a totally different clan or tribe, or could there have been a connection between them and the Sinclairs who came to England with William the Conqueror from Normandy in 1066 (thus alluding to Viking ancestry)? OR, could there have been a totally different origin, one taking these artisans back to an earlier history in the Middle East? There were definitely 'Sinclairs' living in the area near Oban as early as the late 17th century). One practical explanation for these men in Argyll might be the fact that Sir John Campbell of Glenorchy had been made the Earl of Caithness in the 1670s, after he had foreclosed on the debts of his Sinclair relative. This could have given Glenorchy plenty of time to choose some of the willing Sinclair men of Caithness for better employment in Argyll. One Duncan Sinclair was a tacksman (overseer) on a Campbell estate, while there is evidence of others being soldiers with Argyll regiments in battles as far away as Spain, North America and South Africa. This might be a reasonable justification for finding Sinclairs in Argyllshire, but they were small in number compared to the MacNacaerds who also occupied the area in that time frame, and earlier. Argyllshire is a very large county and the topography is extremely rugged. Old Scottish documents such as parish records and tenant lists show that there were several MacNacaerds in some of the most remote and isolated areas, as well as the more populated towns and villages. Their occupations range from agricultural labourers to a burgess in Inverary, but strangely, as yet, none have been found to be such an artisan as George Black describes. How far back in time must we go? Records of the name appear as early as 1297 (when Gregor Makenkerd agreed to serve Edward I of England in France). 1 However, the name gradually converted to Sinclair in the early 18th century, and within a few decades the name of MacNacaerd all but disappeared from the hills and glens of Argyll. If the MacNacaerds of Argyll were originally such craftsmen, where did they come from? Where did they learn this trade? Why would all the descendants of the original craftsmen decide to change their name from the Gaelic McNacaerd to the Anglicized Sinclair, after several centuries of being employed in many different occupations? How would the McNacaerds, even in those remote areas of the Highlands and the Islands, have come up with the same name? Was the name change imposed on them following the unsuccessful rebellions of the first half of the 18th century, in an effort to eradicate Gaelic names, bagpipes, and even tartans? Can it really be as simple as the word "tinkler" rhymes with Gaelic pronunciation of "Sinclair"? Why not "Campbell", the name of their landlords and overlords? Click here to read a wonderful website discussing travel by sea between Ireland and Islay and Western Scotland (Argyllshire) - Being surrounded by the sea "influences everything that happens in Islay." Situated near the southern end of the Hebrides, the Isle of Islay has long been reknown for it's fine peaty whiskys and good farmland. Historically, however, Islay was the pivotal centre of the prosperous north Atlantic islands, including parts of Ireland, and the Argyllshire mainland, which became the seat of Lords of the Isles. The ruling MacDonalds owed allegiance of their mainland possessions to the King of the Scots, but to the King of Norway for their island possessions. Once the MacDonalds were defeated at the Battle of Largs in 1263, the islands were eventually ceded to Scotland. Yet, they maintained power in that part of Scotland, as Angus MacDonald was a strong ally of Robert the Bruce. him with necessaries for his expedition." It is believed that MacDonald supplied Bruce with 1,500 warriors at Bannockburn, for which he was handsomly rewarded, including the post of Honour (the right of the Royal Standard). Thus the MacDonalds 'reigned' and held court at Finlaggan, a splendid castle built on an island loch on Islay, and where Council sat and administered their domain until the early 17th century when it came into the hands of the Earl of Argyll. What has this to do with 'Sinclair'? There is no documentary evidence that there was a Sinclair on Islay prior to 1745, but many by that name thereafter. However, the name Gilchrist McNarkerde appears as early as 1541 in The Exchequer Rolls of Scotland (rentals) for a property called Braid in the west of Islay, and several tenants with the surname of MacNokaird occur in later rentals on the adjacent farm, Gearach, near the site of the castle at Finlaggan. Could this Gilchrist McNarkerde tenant have been a craftsman of such fine brooches and metalwork now displayed in the Museum of Antiquities in Edinburgh? Most of the records indicate that the jewellery was found in the same parish where this man lived, and there is, coincidentally, a small valley called the Gleann na Cairdaich, or glen of the smiddy, only a mile to the north of Braid. Who else would employ such artisans and craftsmen of fine jewellery and metalwork but the powerful Lords of the Isles? The earliest Islay "Sinclair" record found was an inscription on a gravestone near Bridgend for an Archibald Sinclair who died 1749, age 35 years. Since this is around the crucial time between the use of both names, it was important to find out who this early Sinclair was, and where he came from. Was he an 'incomer', or a native to the island - a man who changed his Gaelic surname to an English translation? Mentioned in the 1741 tenant list was an Archibald McNakaird of Nerebie farm, in Kilarrow parish. The Stent Book, recording of municipal proceedings on Islay in 1745, calls for the appointment of Archibald McNokard in Neriby to search neighbouring houses for stolen property. If this is the same person as Archibald Sinclair who died in 1749, it might appear that his neighbours were not at all pleased to be spied upon! Archibald I maintained his association with numerous other expatriate Ileachs in Glasgow, and by 1862 they banded together to form the Glasgow Islay Association (which is still operating today), "for the purpose of affording natives of Islay resident in Glasgow an opportunity to discuss questions affecting the material interests of their native Islay; the formation of a fund to enable them to afford relief to necessitous and deserving natives of the Island resident in Glasgow; and to advance the interests of Members, and Celtic matters generally, in the City of Glasgow and elsewhere." Street, Glasgow, towards which many spirits gravitated"
The influence this fine man had on his son must have been great, as it seems that he more than amply filled his father's shoes. Upon Archibald II's death, there was erected by the Glasgow Islay Association a magnificent monument to the memory of in the Southern Necropolis in Glasgow. On one side it reads, 'Erected by the Islay Association and friends in memory of Archibald Sinclair, Celtic Press, Glasgow. A warm hearted, hospitable Highlander. A true friend, and a distinguished Celtic Scholar. Here he sleeps with his Father and Mother, and with his Brother and Sisters. In his day he did what he could for Highlanders in Glasgow and Islay. His works praise him. Born May 27, 1850. Died February 1, 1899"
On the reverse side of the gravestone is the same inscription, translated into Gaelic, in memory of 'Gilleasbuig [Archibald] Mac na Caerdadh' [Sinclair]. 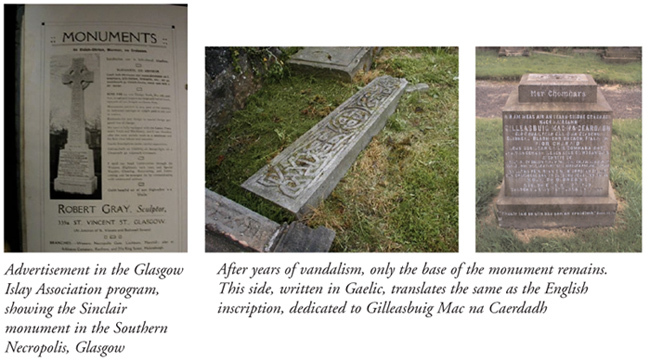 Finally, proof 'written in stone' that the Sinclairs of Islay were known as McNaCaerds, and the names were interchangeable by those who knew and used the Gaelic language! However, this still begs the questions: 1. Where did these craftsmen come from? 2. Is there a relationship to the "Sinclairs" who do have a documentary lineage to the Normandy St. Clairs? Further back in time, legend has it that these Scots originally came from Greece via Egypt, then Spain, then Ireland. Gaul in what are now France and Germany." It is obvious that for many centuries, even two millenea, the origin of the people of Argyllshire has been cloaked in mist and mystery. Anthropologists, archealogists and historians may discover evidence to support their views, and to refute others. To date the documentary proof really hasn't surfaced to make an iron-clad theory to identify the source of these ancient Argyll inhabitants, including those mysterious MacNocaerd/Sinclairs! ( or if ) these ancient people connect with the Norman/Norse Sinclairs who settled elsewhere in Great Britain, and brought their paperwork with them. 6 Clifford N. Jupp, 'The History of Islay from Earliest Times to 1848", pub. by the Museum of Islay Life, Port Charlotte, Islay. Toni’s theories about our name in Argyle have fascinated our family members. She’s worked tirelessly looking for any links to the MacNokairds, other lines of our family, and where these folks might tie back into the known family lines. Even with DNA digging into it, the lines remain mysterious.